Maintaining the integrity of subsea pipelines is essential for all oil and gas operators for a variety of reasons. This includes but is not limited to; ensuring the safety of offshore operations, limiting the risk of environmental damage, legally complying with strict regulations, and maximising production via operational efficiencies / extending asset life. 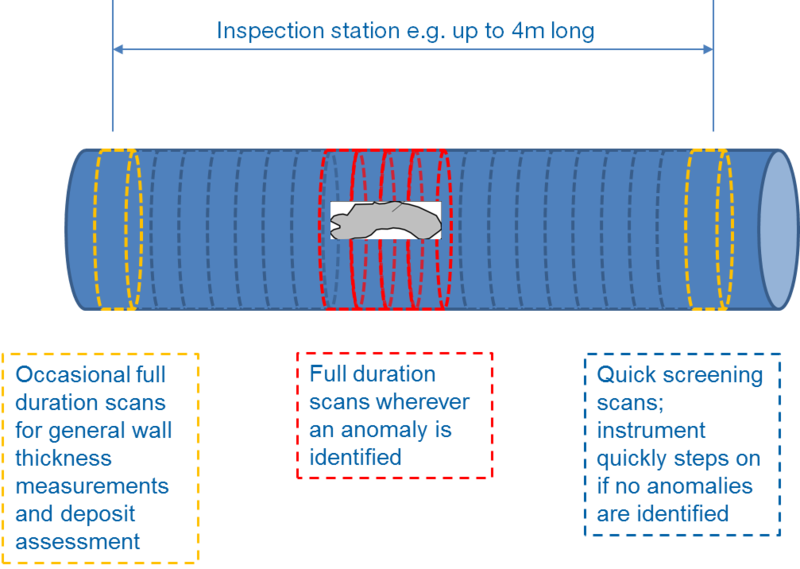 DiscoveryTM, the world’s only field proven subsea CT scanner, is a non-intrusive inspection instrument that enables offshore operators to quickly identify pipeline integrity flaws and obtain accurate wall thickness measurements without stopping or interrupting normal pipeline operations. In this blog, we will discuss three reasons why DiscoveryTM is used by operators across the globe to ensure the integrity of their assets. A continued difficulty facing Operators is the amount of useful inspection data available to them. In many systems, conventional inspection techniques (such as in-line inspection, ILI) may not be practical or even possible. In such cases, Operators may be forced to limit themselves to performing localised inspections at potential “hotspots”. Depending on results of inspections performed at the “hotspots”, further inspections may be required which can be a costly process. 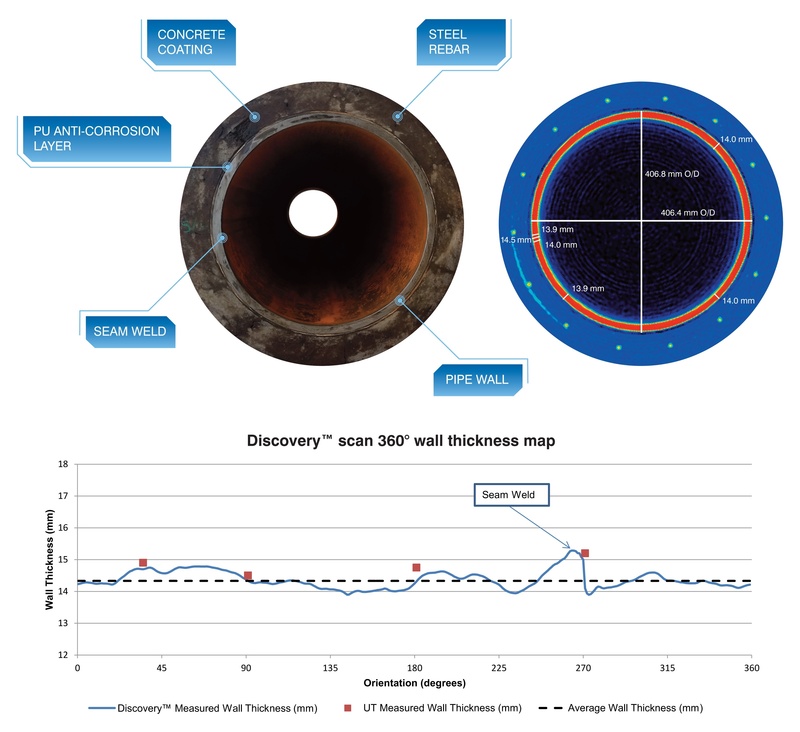 By utilising Discovery’s “fast screening” application operators can rapidly identify any defects and quickly determine whether the pipeline’s integrity is within the acceptable tolerance specification. Once a potential anomaly has been identified via the fast screening method, a more detailed and accurate scan to fully characterise the anomaly can be also undertaken - using the same technology. This eliminates the need to deploy a secondary technology to validate the findings from the initial fast screening inspection, allowing operators to obtain the maximum amount of valuable data for critical decision making (for example for life extension) from a single inspection campaign. As DiscoveryTM is a non-intrusive external scanning technique, there is no requirement to remove any external coverings or coatings - being equally adept at scanning through 50mm of heavy concrete weight coats as it is at scanning through micron-thick fusion bonded epoxy coatings. An example of a concrete weight coated pipe, representative of those which have previously been scanned by Discovery™ is shown below. DiscoveryTM can also be used to obtain wall thickness measurements of a variety of pipelines and pipeline systems including; pipe-in-pipe, pipe bundles, risers, jumpers and piggyback lines, all in one single scan and in real time. Since completing its first full commercial scanning campaign in 2015, Discovery has now successfully completed over 2000 scans for a number of operators in the Gulf of Mexico, North Sea and Arabian Gulf. DiscoveryTM has also received Lloyd’s register recognition after successfully determining the depth limit for reliable Probability of Detection and typical sizing tolerances for metal loss anomalies at the inner and outer positions of subsea pipelines. These capabilities were determined in accordance with recognised guidelines for offshore pipelines and were further validated using Non-Destructive Examination standards specifically for the technique of Computed Tomography (CT). By utilising the data provided by DiscoveryTM, operators can now quickly and accurately identify and characterise asset integrity flaws in any type of pipeline, through any type of protective coating. This can and has led to operators saving up to 1/3 on their overall inspection campaigns when compared with conventional scanning techniques. Watch our webcast or request a lunch and learn to find out more. Tracerco brings comment, news, how tos and more on their blog. Sign up for regular notifications of new posts.